Here is our review of the Schmidt & Bender PMII 4-16X P3 Rifle Scope. This report is a joint effort between Sniper’s Hide and 6mmBR.com. The S&B PMII is almost certainly one of the top tactical optics in the world, and it ranks among the finest rifle scopes ever made, superior in most respects to other tactical scopes, whatever the brand. It is ideal for military and tactical use and it is also a superior hunting and varminting scope, one that delivers exceptional optical quality along with mechanical reliability even under the harshest of conditions. A Schmidt & Bender scope is a very expensive piece of equipment. I’m often asked, “are these scopes really worth over $2000?” My answer is “absolutely”. But before I can explain all the reasons why, let me first recommend you forget everything you think you know about tactical scopes. Even if you’ve used a Leupold Mark IV Series, or a Nightforce, the Schmidt & Bender PMII is another breed entirely, with features found on no other rifle-scope. These special features, combined with the scope’s superior imaging and outstanding reliability, are what make the product worth the high price. The Schmidt & Bender PMII outperforms nearly every competitive scope in so many ways it is hard to know where to begin. But first and foremost, the scope’s reliability in the real world (not just a testing lab) is without peer. I’m a tactical shooter, not a benchrester. My rifles see hard duty in the field, in challenging environments. I shoot in all conditions–from blistering 106 degree heat to hard-driven freezing rain. 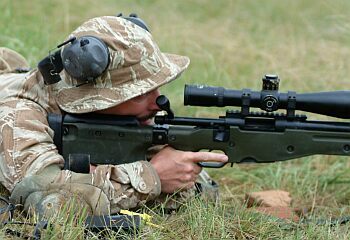 I regularly shoot tactical competitions; and when I go, no matter what combination of scope I am using at the time, I always have an S&B in my Rucksack as a back up. Why? Because I know it will hold up. At every tactical match I attended in the past two years at least one scope from another maker broke or failed in some significant manner. From budget scopes to top-of-the line “military” models, I have seen ALL the other brands fail at some point in tactical competitions. With a broken optic, you might as well pack up and head home. If I’ve traveled half-way across the country and spent hundreds if not thousands of dollars to compete, the last thing I want is equipment failure. That’s why I always bring an S&B with me. Total reliability is something you can’t put a price on. The documentation that comes with every S&B PMII also sets it apart from anything else on the market. Open the box of a Police Marksman Series and you know you have something in a class of its own. The manual is 35 pages long. It has complete specs on the scope, detailed instructions for all adjustments, and tables and charts for all the available reticles. The documentation can only be compared to the owner’s manual of a German luxury car. When it comes to an S&B, the most striking feature is what you see through the glass–the resolution and clarity. I am including a photograph of a USAF 4-Color Resolution Chart taken through a 3-12X PMII from 47 yards away. All the technical terms used to describe optical resolution would not do Schmidt & Bender justice, so I’ll refrain from repeating them. Just trust me that S&Bs display just about the best color fidelity, image sharpness, and contrast you can buy. You’ll have to believe me when I say your eyes can tell the difference in every way–color, brightness, sharpness, you name it. Stated simply, looking through S&B PMII is like looking through a 30X Zeiss or Leica spotting scope compared to looking through a typical 10X scope. That isn’t to say any good scope can’t resolve targets better than you and I to begin with, but there is a noticeable difference with the S&B. If a well-hidden target were concealed among the foliage, I have no doubt that any color or contrast differences would be spotted using an S&B PMII. The best word to describe the resolution of these scopes is “vivid” and on a par with the finest high-end camera lenses. Now to the nuts and bolts of the scope. Weighing 32 ounces, about the same as a Nightforce NXS 5-22×56, the 4-16x scope is relatively heavy for its zoom range. At 15.5″ overall, the 4-16x is about average in length for a mid-range zoom. The 3-12x version (above), is two inches shorter and 3 ounces lighter and noticeably more compact than its bigger brother. All the Police Marksman Series scopes feature 34mm main tubes. The fat main tube allows Schmidt & Bender to deliver enhanced elevation adjustment range. The downside to the 34mm tube is that it limits the number of commercial ring-sets that will fit. But you should still have no problem finding good rings if you stick to a premium supplier like Badger. I use Badger Ordnance Rings that are tailor-made to fit the scope. I rarely find it necessary to shoot more than five rounds to zero any of my S&B PMII scopes. They come properly adjusted and centered right out of the box and use very little windage on my custom rifles. 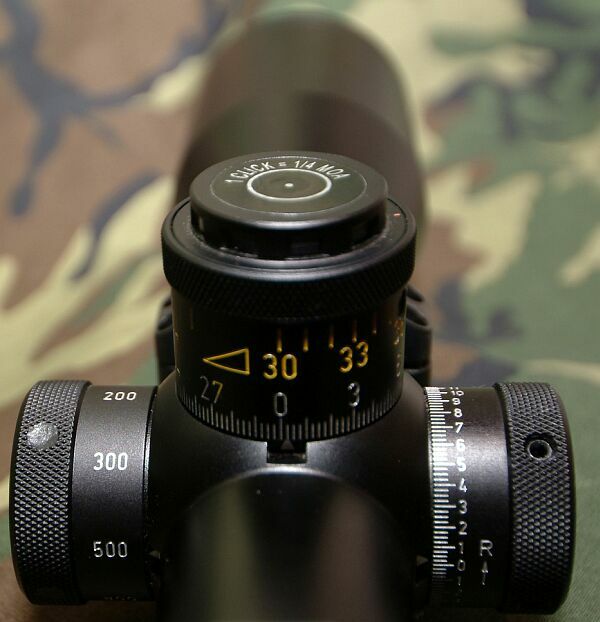 The new MOA version of these scopes use a 1/4 moa double-turn knob (two rotations to go from min to max elevation). The first thing you’ll notice are the “windows” on top of the elevation turret. These windows show the shooter when he’s dialed into the second rotation of the elevation turret. A clear panel displays the first rotation, while a yellow panel shows the second. The lower white-painted index numbers read from 0 to 27 MOA, though the adjustment goes to 29MOA before it shifts to the upper set of yellow numbers commencing at 30MOA. The double-turn knob has 56MOA of complete rotation. The final index mark is at 54MOA with two MOA lines beyond. Both the PMII series as well as the MKII series feature a zero-stop allowing the shooter to use the scope in complete darkness. 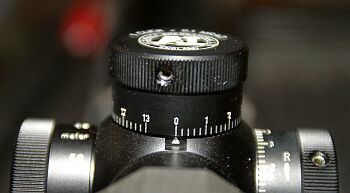 Once the scope is zeroed, you simply loosen the two small Allen screws on the turret, and rotate the turret cover twice in the opposite direction to set the stop to zero. Once you’ve set this, you can return the scope to zero at any time without looking. One should note the zero-stop begins about three clicks below absolute zero. Both windage and elevation adjustments can be distinctly felt as you turn the scope to the desired MOA. The “feel” of the adjustments is very positive; there is no question when you adjust either elevation or the windage on this scope. Both my 4-16X models have a side-focus knob, which adjusts from 50 meters to infinity. (Yes even the MOA version’s side focus is marked in meters.) After 50m it moves to 100m and continues at 100-meter increments to 1000m until passing through to infinity. Compared to some other scopes on the market, the correlation between the side-focus markings and correct parallax settings is very good, though you still have to look through the scope to get the best combination of zero parallax and target sharpness for any given distance. I have one AI MKII version 3-12X that does not have a side-focus knob, however I have never had an issue with parallax at any range. This scope, a “demo” model from Accuracy International, took a serious beating before I received it. Despite a large gouge in the front bell, it has yet to show any signs of trouble. The difference between the single turn-version and the double-turn MOA version is simple enough–how much you rotate the elevation knob. Additionally, the single-turn version uses a centimeter/mil-rad scale rather than quarter-minute-of-angle index marks. The single-turn turret is marked 0-13, which translates to 130 centimeters of elevation. That covers a lot of ground in one turn, roughly 50 MOA, which makes this one of the most fool-proof scopes ever created, once you get the hang of centimeter increments vs. 1/4 moa clicks. Like the USO EREK knob, I believe for a tactical shooter or even a varmint hunter, a single-turm elevation knob is an outstanding idea. The exact amount of elevation is always right there in front of your nose–you don’t have to ask “let’s see am I up one turn plus 8, or was it two turns plus 8”. The USMC has been using a single-turn knob since the MST 100 was first added to the M40AI Sniper Rifle. The single-turn elevation knob is a practical and useful tool for the user under stressful conditions. It allows the shooter to work in low light or no light. This is not to say the double-turn is any less effective. If the shooter is not comfortable converting to metric values, the double-turn MOA is equally well-suited for the tactical shooter. The windows allow the shooter to quickly determine which elevation level he is using, and the markings are bright enough to be used under low light conditions. 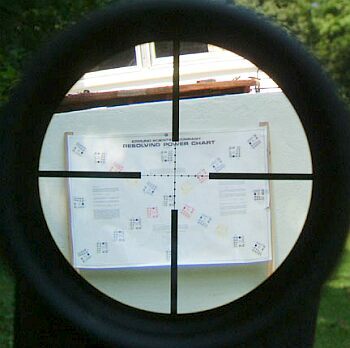 “The P-3 Mil-Dot Reticle was developed by the U.S. Marine Corps in the late 1970s as an aid for the Marine sniper in estimating distances. It has since become the military standard for range-estimating within all branches of the service. In tactical shooting, we find Mil-Dots extremely useful when holding-off for windage or elevation, or when it is not practical to dial-in changes. For example, when you need to make a quick shot or when the wind is cycling directions. From the Schmidt & Bender website you can find the conversion tables for Mil-Dot hold-overs. And as noted, complete Mil-Dot conversion tables are supplied with each scope. Overall I can tell you the S&B PMII lives up to its reputation. It is a strong, reliable tactical scope worthy of consideration by any serious tactical shooter or hunter. I have never hesitated to use any of my S&B PMII’s under some of the harshest conditions. At the July 2004 Tac-Pro match in Texas we had to cope with heavy rain and thick Texas mud. My rifle was completely covered, as was every other shooter’s equipment. During this match roughly five rifles went down due to the conditions, whether from a jammed action, inoperable magazine, or water-damaged scope. At our 5PM dinner break prior to our night shoot, I took a garden hose from the house, and used it to power-wash the scope, rifle and chamber. I literally plugged the bore with a finger and sloshed water all over the gun. After running a single oily patch through my bore, I continued to shoot without failure. The S&B never skipped a beat. I took my AICS with a 4-16X PMII to the range for some detailed scope-testing. I had never conducted tracking/elevation tests with this scope before as its previous performance was great. This also gave me an opportunity to shoot some 155gr Lapua Scenars. (I’ve mostly fed it a diet of Black Hills 175gr Match so far). So I re-zeroed the rifle for the 155 Scenars, and then moved to the 22MOA vertical test. I have found that most scopes begin to show signs of adjustment problems between 16 MOA and 20 MOA elevation. This is the range where problems become quite apparent to the naked eye, so I made sure to crank in 20 MOA and then some. The day was actually pretty bad for testing. We had 6- to 8-mph winds with gusts reaching slightly higher. The problem wasn’t so much the wind’s effect on the bullet, but the wind’s effect on the targets. The frames blew back and forth, changing bullet impact as much as an inch depending on which way the frame moved. I did my best, given the wind. In any case I really don’t have to excuse the results as the scope performed flawlessly from start to finish. The number one internal scope problem most shooters encounter is unreliable tracking, not poor glass. Therefore, with any scope it is vital to test the full range of windage and elevation adjustment. 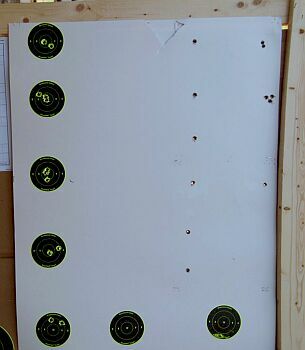 Our box test consisted of a central aiming point and four separate one-inch diameter impact circles. Each circle is 4″ apart vertically and 6″ apart horizontally. My testing showed the scope’s tracking to be positive and repeatable throughout the adjustment range–performance many scopes can’t deliver. I also found that each click was positive. Unlike many other scopes, there was no lash problem. With the S&B you dial two clicks and you get two clicks of reticle movement. You don’t need to click beyond your chosen setting and then go back a click or two. During the box test I ran out of 155gr Scenars and switched to the 170gr Lapua Lock Base. The ammo change altered the baseline zero a bit (lower POI), but the tracking remained dead-on. When I dialed in 4 moa “up”, for example, that’s exactly how much the bullet impact moved. Four clicks gave me 1 moa change, whether moving vertically or horizontally. In a perfect world, a Schmidt & Bender would cost no more than a Leupold and would have 100 moa of elevation adjustment, 50 moa each side of center. But no product is perfect. In terms of shortcomings, the S&B PMII has very few indeed, but the price remains a barrier to many potential customers. For Americans, who will likely prefer the dual-turn MOA version, expect to pay over $2200. You could build a very nice rifle for the price of the scope alone. The AI MKII single-turn centimeter version with its 1/10th MilRad adjustments is the least expensive, but it’s still up near the $2000 mark. And with the Euro on the rise, these scope prices are not going to fall any time soon. Too often S&Bs are back-ordered, or unavailable from major dealers because there is very little “profit” room for US vendors of these scopes. The biggest shortcoming I have found with the S&B PMII is the need for an angled scope base with at least 29MOA lift. First, let me provide a little background. These scopes can be found as part of a package deal from Accuracy International (AI). The AI integrated one-piece Base and Rings have 29MOA built-in to them, hence the scope is made to work with that set-up. Every time I have mounted the scope on a 20MOA base I have lost a large amount of MOA. Depending on your rifle you may have no problem. For those looking for a bolt-on solution, I’ve found that a 30MOA NEAR-brand base provides a perfect 100-yard zero and more than enough elevation. If you use the AI Base and Ring set-up, you can use a flat rail on your rifle with no problems at all. 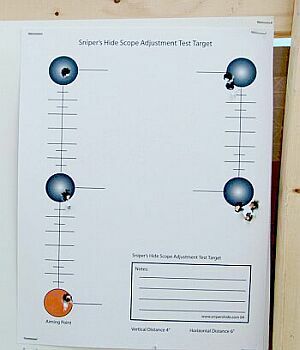 I have seen S&B scopes “cross-decked” from one rifle to another on the firing line and they work extremely well. GA Precision 338 Lapua Magnum, Accuracy International (AI) 2.0 Chassis System, AI version MKII 4-16X Single-Turn CM scope. So–bottom line–is the S&B PMII worth over $2000? Each shooter has his own requirements and sometimes his appetite for premium gear exceeds his budget. For many shooters, a $2k scope is completely out of the question no matter how well it is made or how well it performs. However, for myself, given the events I attend, the environmental conditions in which I compete, and my investment in both time and equipment, I believe a scope of this caliber is an absolute necessity. I can easily say that if you can only afford one high-end scope, the S&B PMII Series is an excellent choice for a tactical marksman, for a hunter, and for anyone shooting targets at unknown distances. (Yes a benchrester or 1000-yard shooter needs more magnification and the mil-dot reticle may not be ideal–but there are other products for those disciplines.) For those who want and need a tactical scope, the Schmidt & Bender PMII Series is absolutely top of the class. It delivers everything a tactical shooter requires–plus a little bit more–something I call confidence. 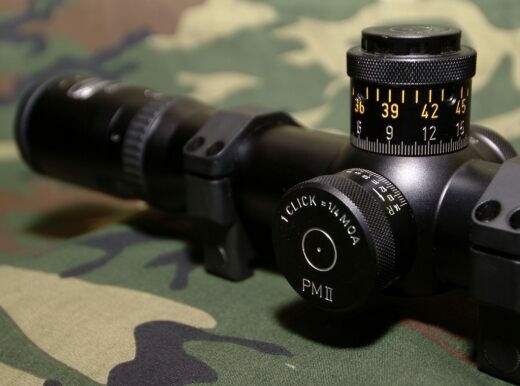 The S&B PMII scopes used in this article were purchased from Tac-Pro Training Center of Mingus, Texas, and from a long-standing member of Sniper’s Hide website by the author. Contents Copyright © 2004, SnipersHide, LLC and 6mmBR.com, All Rights Reserved. No reproduction without advanced permission in writing.